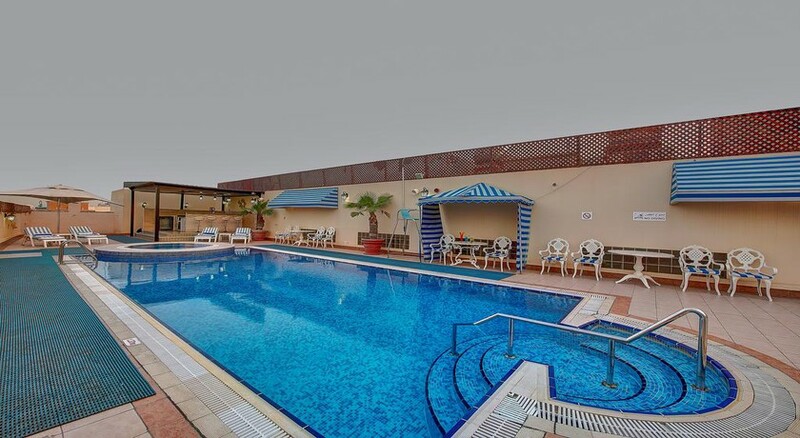 Nihal Palace is a 4-star rated hotel nestled in the shopping district of Dubai and is a great choice if you love shopping while holidaying. Hotel facilities include a rooftop pool and pool bar, where you can unwind and spend some time soaking up the sunshine, plus a rejuvenating Health Club & Spa with a variety of inviting treatments on offer. All the rooms in this hotel feature European-style fabrics and furnishings, making your stay truly luxurious. There are vast deserts and picturesque golden beaches near the hotel that are great to explore, whether you fancy an evening stroll along the sand or an exciting 4x4 safari. The hotel's dining scene includes the popular Al Riqa Restaurant, plus a lounge bar and traditional Irish pub for guests to unwind in. Sitting in the heart of Dubai city, the hotel is proximate to many shopping malls whilst Al Rigga Metro Station is only about 5 minutes’ walk away. Dubai’s famous Gold Souk is also a 5-minute walk from the hotel. You may also visit the nearby Dhow Wharfage, where traditional boats are constructed. The hotel has 135 rooms and suites that feature modern interiors with warm colours and rich furnishings. 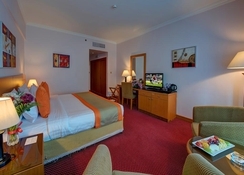 The rooms are categorized into Superior Rooms, Deluxe Rooms, Junior Suites and Non-smoking ones. All rooms are air-conditioned, have a private bathroom with shower and feature general amenities such as cable television, minibar, in-room safe and internet accessibility. Al Riqa Restaurant is the main eatery at the hotel and serves a wide variety of International cuisines around-the-clock. It serves breakfast, lunch and dinner and you can choose to have the buffet or go à la carte. There are traditional Arabic, Indian and Italian foods available at the restaurant. There is also a Dublin Arms Irish Pub that serves lagers and spirits until late in the evenings. A rooftop pool complemented with a pool bar and hot tub is a nice place to unwind while enjoying the spectacular views of the city. The hotel also features a Health Club & Spa complete with a gym and sauna. There is a complimentary shuttle service running between the beach and Deira City Centre Mall for when you want to venture outside of the resort.